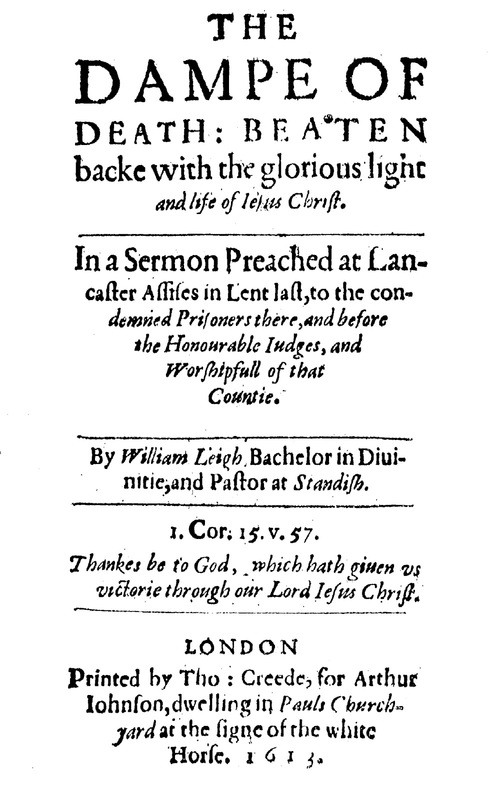 In 1613 a sermon given by William Leigh (Pastor at Standish Hall) to the prisoners condemned to death at Lancaster Assizes was published under the title The Dampe of Death: Beaten Backe with the Glorious Light and Life of Jesus Christ. 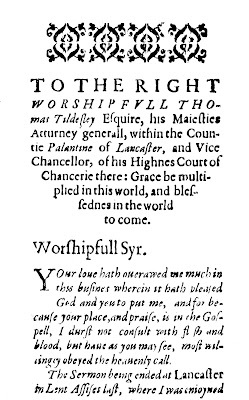 TO THE RIGHT WORSHIPFVLL THOMAS Tildesley Esquire, his Maiesties Atturney generall, within the Countie Palantine of Lancaster, and Vice Chancellor, of his Highnes Court of Chancerie there: Grace be multiplied in this world, and blessednes in the world to come. YOur loue hath ouerawed me much in this busines wherein it hath pleased God and you to put me, and for because your place, and praise, is in the Gospell, I durst not consult with flsh and blood, but haue as you may see, most willingly obeyed the heauenly call. The Sermon being ended at Lancaster in Lent Assises last, where I was enioyned by authoritie to preach to the prisoners then condemned to die, it was your desire to have a copie in priuate of that which was then deliuered in publique, at what time I truely tolde you, my Notes were scattered and vndisgested, rather carried in my heart, then in my hand, yet (would God assisting me) in conuenient time binde them together ere they were too farre fallen out of my minde and memorie, which I haue here done accordingly, and sent them to your worship, as a constat of my vnfained loue, yet with this Caution, you neuer thinke what was then deliuered by voyce, can be carried so powerfully in papers, as it was in speech. The words contained in the two tables which God gaue to Moses, from the holy Mount, were first spoken by the mouth of God, ere they were written by the finger of God, and then carried into the valley to be heard and kept of all the people. So may I likewise say of the Gospell, Voyces and Prophesies went of the blood of Christ, ere euer it dropt out of his veines. But if gratious words had not fallen from the mouth of Christ, Christians had neuer conceiued either the power or vertue of his death. For as there is a blood of redemption, so there is a word of reconsiliation, and surely where the word teacheth not, there the blood droppeth not: you are religiously wise to conceiue whereat I ayme. To wit, that reading, preaching, and practizing of pietie, may all goe together, like Saul and Ionathan, of whom it is said, that they were louely in their liues, and at their deaths were not diuided. Learned you are in your owne lawes, and therefore knowe better then I can tell, that though the body of your lawes lie in your bookes, yet the soule thereof is in your mootes and pleadings, as also that the barre and bench doe more powerfully end, and profitably determine our causes, then the bookes in your chambers can doe: I speake in no desperagement, either of your bookes, or our Bibles, which in themselues are learned, sacred and holy, but to intimate to all the world, that if you pleade not, and we preach not, neither states can long stand, nor soules can be ordinarily saued. For though holy bookes be holy Oracles, and registers of Gods truth, Yet must the Priests lippes preserue knowledge, and the people must seeke the lawe at his mouth, for he is the messenger of the Lord of Hosts. Good Sir, take what I haue written, in lieu of my loue, may it pleasure you and benefit Soules, either liuing in this world, or dying to a better, it is all I wish in my heart, it is all I begge in my prayer, and what is in my power or Element to doe, it shall be alwaies yours, my penne is yours, my paines are yours, my selfe am yours, to be commaunded in him, who commandeth all, with my daily prayer to God, for you and yours, euer to be kept vnder his holy and helping hand of prouidence and protection. Standish this seuenteenth day of Aprill. 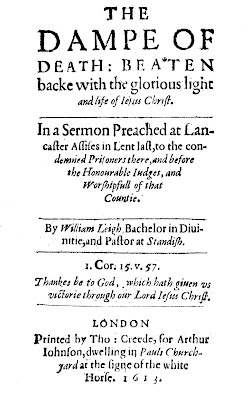 1613. For yee are dead, and your life is hidde with Chrift in good. Then fhall yee alfo appeare with him in glorie. Then Shall ye alfo appear with him in Glory.